Outlook Proactive - helps you to feel healthier and look better, slows the effects of aging, and helps prevent diseases from developing in the first place. Reactive - helps you get better once you are sick. Approach Treats the cause of ailment to ensure optimal long-term health. Treats the symptoms of ailment rather than the cause. Methodology Relies on herbs, diet and nutrition, exercise, lifestyle changes, and mental and spiritual training for treatment. Relies on drugs and surgery for treatment. Efficacy Each Ayurvedic herb contains naturally occurring Phytonutrients which have many positive antioxidant and immune system effects. Ayurveda relies on herbal extracts (concentrated botanical compounds) which are especially rich in Phytonutrients that work synergistically on the body to promote natural healing and optimal health long-term. 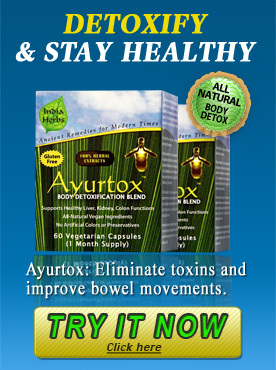 Typical Ayurvedic remedies contain hundreds of Phytonutrients. What nature has provided cannot be replicated in laboratories. Western drugs are produced synthetically with chemicals at pharmaceutical plants. The active constituents of drugs are designed to target specific disease symptoms. While they work well to alleviate symptoms, the potent chemicals introduced into the body create imbalances and have negative impact in other ways which leads to the need for other drugs to counteract damage caused by the initial drugs. This cycle of chemical dependency can lead to significant health deterioration. Also once medication is stopped, symptoms will return until the underlying cause of disease is addressed. Safety Herbal supplements taken with proper nutrition give your body the encouragement it needs to heal itself. The cures take longer, but in the end your body heals itself without side effects. It also becomes stronger and better able to resist disease in the future. Whether the doctor is using a drug or a knife, the goal of Western medicine is to remove what's wrong quickly, either by killing invading microbes or removing parts of your body that are diseased. Drugs by their nature are controlled poisons. That's why they can only be obtained with a doctor's prescription, on the assumption that a doctor's training and careful evaluation of your condition will produce the best possible results with minimal side-effects. An amazing array of drugs have more side effects than the illnesses or problems they were designed to address. Cost Since Ayurvedic Medicine is made from naturally occurring botanicals and supported by 5,000 years of clinical experience, it offers tremendous long-term benefits with no side effects at a fraction of the cost of pharmaceuticals. An investment of $40 per month will provide you good long-term health by minimizing risk of major diseases. You will feel better and better over time. The cost for Western Medicine is exorbitant and rising annually. The cost of drugs in the United States is so high that patients cannot afford to fill approximately 22 percent of the prescriptions written each year. Prescription drugs now represent the single largest monthly expense for most Americans over 65 - approximately $300 per month. This expenditure does not buy good long-term health. The longer you are on medication, the more unnatural you feel.